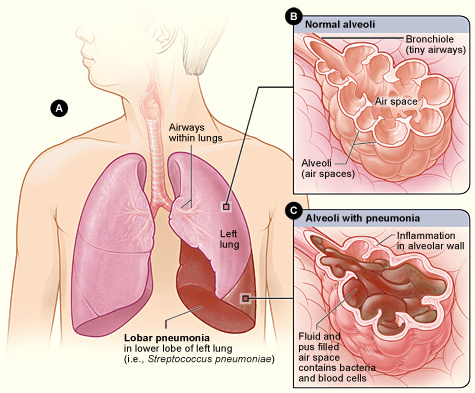 Pneumonia is a disease of the lungs that can be caused by bacteria, viruses, or fungi. The symptoms of pneumonia closely resemble those of influenza or a cold, and sometimes are not diagnosed properly. All these symptoms are treated differently, some with antibiotics and others simply with rest. Typically pneumonia will last one to three weeks; however, some types can be deadly. Prevention is possible and generally healthy people with good hygiene do not need to worry about it as much as those with poor hygiene. There are five main causes of pneumonia: bacteria, viruses, fungi and other infectious agents such as mycoplasmas, and various chemicals. Bacteria, viruses, and fungi are the most common causes. Mycoplasma pneumonia is a mild case caused by bacteria, and is often called "walking pneumonia" because those who have it typically do not realize it. Influenza A and respiratory syncytial virus (RSV) are two types of viruses that can cause pneumonia. Pneumonia caused by fungi is more prevalent in people with damaged immune systems, HIV, or AIDS. In adults, bacteria is the most common cause for pneumonia. 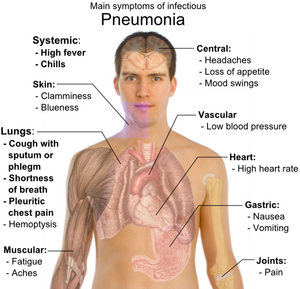 There are many different types of pneumonia caused by bacteria. One type, lobar pneumonia, can either develop on its own, or after catching influenza or a cold. This particular pneumonia affects a lobe, or area of the lungs. There are three examples of Atypical pneumonia, another infection caused by bacteria. Viruses are the most common cause of pneumonia in children. One-third of all cases in the U.S. are a result of respiratory viruses. These cases are all relatively mild; they last anywhere from one to three weeks without treatment. Some cases however can be serious and those that are, may need hospital treatment. Once someone has had viral pneumonia, they also risk getting bacterial pneumonia. The most common cause of viral pneumonia in adults is the flu virus. Other viruses include respiratory syncytial virus, rhinovirus, herpes simplex virus, severe acute respiratory syndrome (SARS)and others. There are three kinds of fungi in the U.S. that cause pneumonia: coccidioidomycosis, histoplasmosis, and cryptococcus. Of those people exposed to these fungi, most do not develop pneumonia, however some do and need treatment. The serious fungal infections are found in people who have immune systems that have become weak from the use of immune system suppressing medicines, or who have HIV or AIDS. Symptoms can also vary based on the origin of the illness (whether it is a bacterial or viral infection), as well as if the patient is an older adult or a child. Non-bacterial pneumonia symptoms come on gradually and are often less severe or obvious. "Walking pneumonia" is when the symptoms are mild and hardly noticeable. Symptoms of a bacterial infection include a temperature that may go as high as 105 degrees Fahrenheit, profuse sweating, and a rapidly increasing pulse rate and breathing. The lips and nailbeds may have a bluish tint to them as a result of a lack of oxygen in the blood, and the mental state of a patient may be confused or delirious. The symptoms of a viral infection are very similar to influenza symptoms and pneumonia can sometimes be mistaken for the flu. Fever, dry cough, headache, muscle pain, and weakness are all immediate symptoms. However, within twelve to thirty-six hours these symptoms can become more severe. The cough will worsen and bring up a small amount of mucous; there is an increase in breathlessness, as well as a high fever and bluish lips. The drinking of plenty of fluids to help loosen secretions and bring up phlegm. Getting lots of rest. Have someone else do household chores. Not taking cough medicines without first talking to a doctor. Cough medicines may make it harder for the body to cough up the extra sputum. Control fever with aspirin, nonsteroidal anti-inflammatory drugs (NSAIDs, such as ibuprofen or naproxen), or acetaminophen. DO NOT give aspirin to children. Have chronic illnesses such as lung disease, heart disease, kidney disorders, sickle cell anemia, or diabetes. Other ways to prevent pneumonia, is to practice good health habits. This includes a healthy diet, rest, regular exercise, etc. If a person is healthy in general, then it is that much easier for their body to not only fight off infections and illnesses, but also to recover from them. This page was last modified on 17 November 2015, at 16:39.